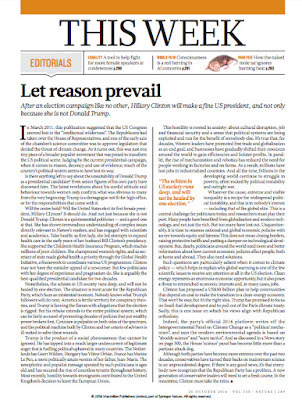 On October 19, 2016, the prestigious science journal Nature took the brave and unprecedented step of endorsing a candidate for a national presidential election. In this case, it was the 2016 American presidential election and the endorsement was for Hillary Clinton. The last time Nature chimed in on politics, March 2011, it was in response to Republicans cutting funding for the National Science Foundation by $4.6 billion, so perhaps somewhat warranted in the opinion of many scientists and other Nature readership. 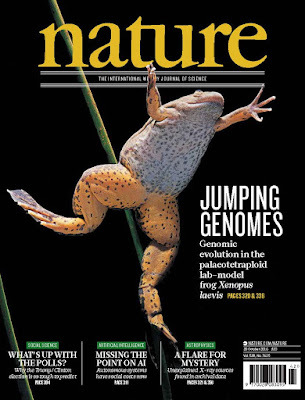 This time around, Nature's editorial is creating much more controversy. Some are praising the journal while others are admonishing it for wading into politics at all, especially the 2016 American presidential election, and cancelling their subscriptions. Well, I'd like to make Future-ish's opinion on Nature's endorsement clear...we love it! One of the reasons I started Future-ish was to get more scientists, designers, and cultural leaders into politics. That objective certainly encompasses science, design, and culture media as well. It is THE reason we started our Public Intellectual Service & Advocacy (PISA) List. Interestingly, I haven't seen that endorsements by major design or culture focused journals or magazines have been all that controversial, perhaps because their endorsements were expected. But science, scientists, and science journals are a different creature. Some see 'science' as objective while others see it as completely biases depending on who is doing it, for what reason, where the funding has come from, and (LOL, but perhaps most legitimate) which politician or policy maker is interpreting it. So to have scientists and/or science journals start speaking out on politics makes some uncomfortable. It reminds me a bit of when the Dixie Chicks spoke out against President Bush and many of their fans responded by saying "just shut up and sing". If you read the comments on the online version of the editorial, the preference for science and Nature to 'just shut up and report science' comes across pretty loud and clear. Discouraging people form speaking out is never a good thing. So Future-ish says BRAVO! to Nature, we hope to see more science-related journals, magazines, other media, and scientists themselves speaking out on political matters, even if they don't endorse the legislation, policy, or candidate we might endorse.